The "Progress in Cell Cycle Research" series is dedicated to serve as a collection of reviews on various aspects of the cell division cycle, with special emphasis on less studied aspects. We hope this series will continue to be helpful to students, graduates and researchers interested in the cell cycle area and related fields. We hope that reading of these chapters will constitute a "point of entry" into specific aspects of this vast and fast moving field of research. 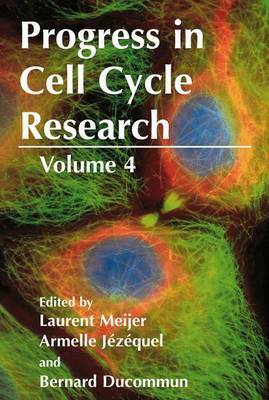 As PCCR4 is being printed several other books on the cell cycle have appeared (ref. 1-3) which should complement our series. This fourth volume of PCCR starts with a review on RAS pathways and how they impinge on the cell cycle (chapter 1). In chapter 2, an overview is presented on the links between cell anchorage -cytoskeleton and cell cycle progression. A model of the Gl control in mammalian cells is provided in chapter 3. The role of histone acetylation and cell cycle contriol is described in chapter 4. Then follow a few reviews dedicated to specific cell cycle regulators: the 14-3-3 protein (chapter 5), the cdc7/Dbf4 protein kinase (chapter 6), the two products of the pI6/CDKN2A locus and their link with Rb and p53 (chapter 7), the Ph085 cyclin-dependent kinases in yeast (chapter 9), the cdc25 phophatase (chapter 10), RCCI and ran (chapter 13). The intriguing phosphorylation- dependent prolyl-isomerization process and its function in cell cycle regulation are reviewed in chapter 8.